Starz wisely made the decision to open season three of Survivor’s Remorse with a doubleheader — running episodes one and two back to back — so I’m recapping them as one whole opening chapter. It’s so hard to say goodbye, but this is how you do it: Uncle Julius was the sort of man who donated loose change to the church in a Crown Royal bag. He was also the sort of man who had no problem cutting cocaine he was selling to a priest with a prayer card of St. Francis of Assisi. 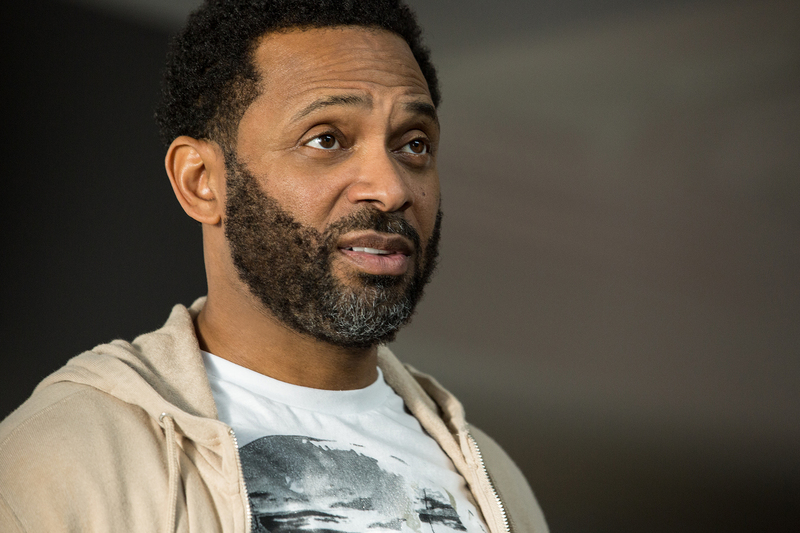 What a shame this character is gone, because when Mike Epps is in a role tailor-made for his talents to shine, he’s absolutely delightful. Mike Epps as Uncle Julius. Uncle Julius (Epps) is dead, and the Calloways are left struggling to cope, but thankfully we’re treated to flashbacks that not only felt immensely true to Julius, but which Epps delivers with dazzling precision. As he’s flicking a bag of cocaine for him, Julius asks an Atlanta priest if he’s got anything to cut it. Obliging, the priest pulls out the prayer card. Remember when I said that Survivor’s Remorse essentially uses Cam’s giant windfall of pro basketball and endorsement money as a trojan horse to explore other issues? This week, in the season three double-episode premiere, it’s religion and grief. As the Calloways deal with the aftereffects of Uncle Julius’s death — including working through various stages of the Kübler-Ross model — another picture begins to emerge: their ambivalence toward religion and what brought them there. Delivering another winning line, Cassie (Tichina Arnold) tells the family that she wants a big church funeral for her brother. “Once you get past the molesting s—, Catholics have a good message,” she said. The way we think about religion and black people tends to be rather monolithic. It’s a given that if politicians want black votes, they must go to black churches to court them. There’s a good reason why we tend to ascribe this sort of religious shorthand to black people. Even as the share of the U.S. population that identifies as Christian falls overall, according to a sweeping survey by Pew Research from 2015, black people outpace all other U.S. ethnic groups when it comes to religious participation. But these sorts of blanket assumptions can lead to rather flat on-screen portrayals of black people’s relationship with religion — which is why in 2014, I was excited to see the inclusion of a black skeptic on Adult Swim’s Black Jesus. The other thing we know, thanks to Pew’s big survey of religion, is that young adults are less religious. So it really struck me to see the characters on Survivor’s Remorse exhibit such nuanced relationships with religion. The Calloways are not regular weekly churchgoers and they all interact with faith in different, inexact and extremely personal ways — ways that I think are reflective of modern attitudes toward spirituality and organized religion. Or, in the case of Uncle Julius, they don’t interact with it at all. Julius was a 45-year-old nonbeliever through and through. His last words were literally, “I wish I believed in God,” but his relatives can’t help but try to grasp at something (in this case, his cocaine prayer card) that will soothe their own souls as they’re left to worry about Julius’. Only Reggie (RonReaco Lee), the steady, sober — sometimes unlikably so — voice of reality on the show is willing to see Julius with clear eyes in death. 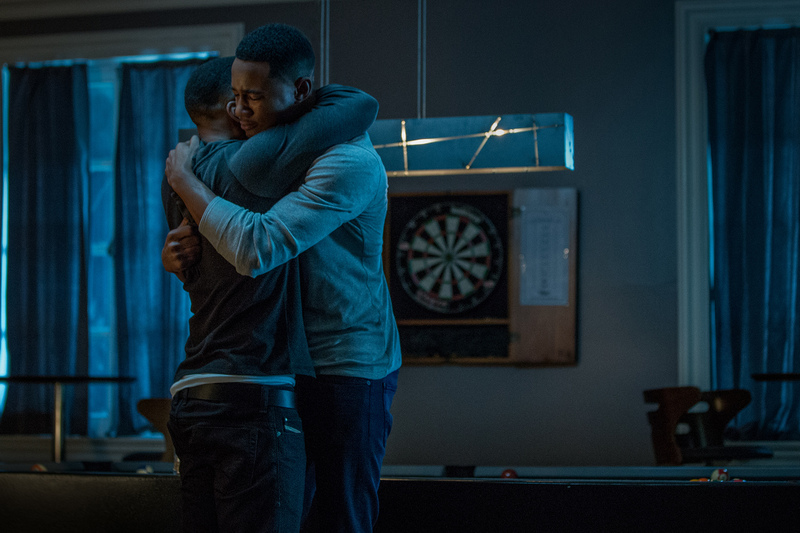 Reggie (RonReaco Lee) and Cam (Jessie T. Usher) share an embrace as they grieve the loss of Uncle Julius. The Calloways are a fairly secular family, but Cassie still wants her brother to have a big funeral service in a nice church. Still, they have to find one because they’re not already members of one — even though church is one of the biggest and most important social gathering spaces for many black Atlantans. A great deal of American television struggles with incorporating religiosity or spirituality into the lives of characters. Generally, it seems to come in all-or-nothing packaging. If a show is not directly situated around the church, as Greenleaf is, or religious identity, the way Transparent and The Real O’Neals are and Big Love was, spiritual considerations tend to lay outside the universes of most characters. The Good Wife is a notable exception; it found a way to deftly treat skepticism and faith with equal respect. Survivor’s Remorse illustrates how people can have a close, complicated relationship with God even if they haven’t been to church in years. Cassie can be cutting and downright cruel toward M-Chuck (Erica Ash). After the crash, when the family is waiting to hear about Julius’s condition, M-Chuck reveals that she’s looking at attending college, and that the owner of Cam’s team, Jimmy Flaherty, is helping her. Cassie remarks that it’s pointless because she thinks M-Chuck will invariably flunk out. It’s no wonder they have such a strained relationship. But Cassie clearly loves and wants to stand behind her daughter. Part of the reason she and the family drifted away from Catholicism, we learn, once the Calloways are back at home after a long and difficult night at the hospital, is because the church wasn’t accepting of M-Chuck being a lesbian. It’s touching to see Cassie straining to remember the words to the “Glory Be” prayer because it’s what she learned in childhood, and seeing Chen (Robert Wu) asking Siri to pull it up because he doesn’t know it, either. Everyone exhibits care and grief differently. During Julius’s funeral, where Jessie T. Usher gives a career-best performance while eulogizing Julius, a priest sprinkles holy water on Julius’s casket. If you believe, it offers some small measure of relief. And if you don’t, it’s just a few droplets on a coffin. Either way, there’s no need to judge. The show also demonstrates how fire can be a soothing disinfectant, even as Cassie balks at the idea of cremating her brother, something her children have no qualms about. Cam is determined to play in a basketball game the following day, no matter how much Reggie offers to get him out of it. (This turns out to be a good decision — Cam scores 51 points.) But he’s still experiencing a heavy dose of guilt because Julius died driving his girlfriend’s car to the mechanic — all because Allison refused to take the new Cadillac Escalade Cam bought for her. So Cam sets the Escalade on fire, which brings M-Chuck rushing out of the mansion while the rest of the family remains asleep in some other wing of the house. M-Chuck, who so often internally feels like the black sheep of the family (or at least, the less-favored child), and who’s lashed out in anger at Allison and blamed her for Julius’ death, has an opportunity to be generous. She both lets go of her anger and relieves Cam of his guilt when she tells him he’s not to blame for Julius dying. Cam promises to play for M-Chuck’s college tuition. Survivor’s Remorse has established itself as a family comedy that finds interesting, provocative ways to comment on social issues. Julius’s death was by far its weightiest challenge and it lived up to it. Let’s see what happens now that Julius is gone. These two episodes provide a textbook case for the value of dramatic irony. They convey how emotion, rather than fact, can so easily and naturally cloud our judgment about a person or situation. The Calloways just knew the driver of the truck that hit Julius was at fault until a comprehensive coroner’s report revealed he wasn’t. In turn, the audience is left to see how that lack of knowledge determines their behavior. And in the case of St. El Chapo, the audience is left with this terrifically uproarious little nugget about Julius that his family will likely never know. Any old person can break bread with a priest. How many of us can cut a line of coke with one? Missy’s eyeroll-inducing voicemail greeting — Don’t wait for the perfect moment; take the moment and make it perfect — is precisely the sort of bourgie faux-lifting platitude you would expect her to have. No wonder Cam is getting serious about Allison. Yes, she makes him smile, but he’s also got healthy models for relationships around him — Cassie and Da Chen Bao, and Reggie and Missy. Between Flaherty mentoring M-Chuck about college and Chen dating his mother, it’s remarkable that Cam isn’t more irked about the way his personal and professional lives are bleeding together. But this is also something he doesn’t have a whole heck of a lot of control over. But they also appear as Reggie is trying to figure out how to wrangle all of Julius’ contemporaries (that would be Pookie, Rome, Silk, Yayo, Cakebread and T. Lo) of dubious character coming to Atlanta to pay their respects. Missy wants to be sensitive and thoughtful. Reggie, as always, wants to minimize cost and hangers-on asking Cam for money. Check out this exclusive clip previewing episode three of Survivor’s Remorse, which will air Sunday at 10pm EST on Starz.